Dishes are one of the never-ending chores in any home. If you use an automatic dishwasher, you need to use specialty detergent. Store-bought versions can be expensive, and unless you chose eco-friendly options, they can be bad for the environment. Making your own liquid dishwasher detergent can save money, reduce the chemicals you use, offer a more environmentally sound solution and reduce the number of plastic bottles you put into the waste stream. 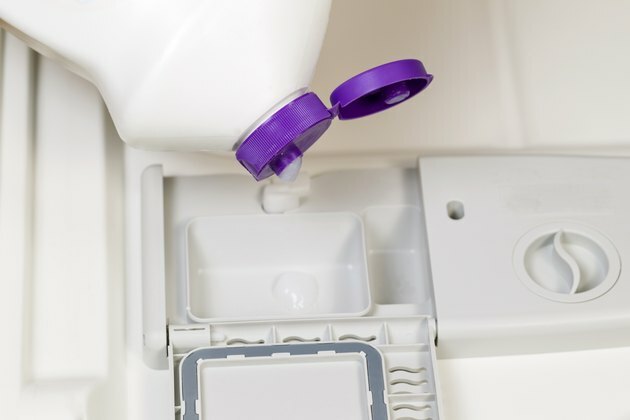 Making your own liquid dishwasher detergent is economical and eco-friendly. For this gel recipe, you'll need 2 cups of water, 1/4 cup of soap flakes or finely-grated soap, 1 tablespoon of liquid glycerin and 2 tablespoons of white vinegar or citric acid crystals. Combine all ingredients in a saucepan and bring to a boil on medium heat. Stir until the soap is completely dissolved, then remove from the heat and allow to cool before placing in a glass container. Place one tablespoonful in the dishwasher's dispenser cup for each load. For creamy, whipped-consistency detergent, you'll need a wide-mouth canning jar and an immersion blender. Combine 3 cups of water and 5 tablespoons of liquid Castile soap in your jar. Slowly stir in 1 cup of washing soda, a little at a time. Cap the jar and shake vigorously to blend well. Invert the jar and let it sit for an hour. Shake well and let it rest for another hour. Shake again, uncap, insert your immersion blender and whip the gel until it's smooth and creamy. Use one tablespoonful per load of dishes. Tip: If you don't own an immersion blender, you can spatula the solution out of the jar at that stage, whip it with a handheld beater or in a blender of any type and restore it in the jar once it's creamy. This easy recipe requires no cooking or blending. Combine 2 cups liquid Castile soap with 1/2 cup of water, 1/2 cup white vinegar, 1 teaspoon of citric acid crystals and 3 drops of essential oil of your choice, if you want a scent. Shake vigorously to combine and pour into a jar or old detergent bottle. For an even simpler version, just use the Castile soap, water and optional essential oil. Shake before each use and use 2 tablespoons per load. Your water type plays a part in how much detergent you need to get dishes clean. If you have soft water, you may be able to reduce the amount of detergent used per load. If you have hard water, you may need to increase the detergent. It's always a good idea to use a rinse aid with homemade detergents to help remove residue from the washing process. The simplest rinse aid is plain white vinegar. You can pour it into the rinse aid dispenser, or add it manually at the start of the rinse cycle. Store all homemade dishwasher detergents in tightly sealed containers and keep in a cool, dark place.